Cleverly designed in "slices" that can be arranged with various delectable bites. Sometimes the best way to bring your favorite people together is to create some separation. 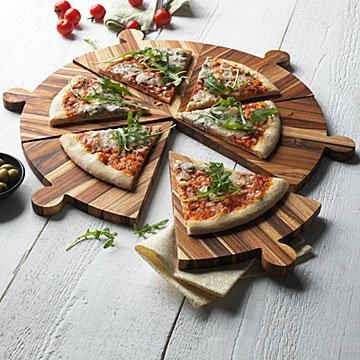 Cleverly designed in "slices" that can be arranged with various delectable bites, this circular board is handsomely crafted from rich teak. The wood creates a sophisticated pattern that complements anything on it, including tapas, cheeses, and yep, pizza, too. Made in Vietnam. Wash with mild soap and water. When dry, apply food-safe mineral oil. Help condition and preserve your Teak Wood Antipasto Server with mineral oil.